My husband and I have owned this home for 15 years, and it is now time to sell. It's a large four bedroom, two and a half baths, with a pool that needs maintenance. In fact, the whole home has needed constant maintenance and upgrades over the years, especially as we live in Florida. My husband has accepted a job in the Silicon Valley in California. He went out there last week to get settled, and to try to establish a routine taking into account the three hour time difference between California and Florida. I am still here in Florida handling the remaining packing and coordinating with contractors for upgrades/fixes. There is an Irish saying that goes something like "You never see a chest (of things) behind a hearse." I try to remind myself of this as I go through my things and decide what to ship 3,000 miles. 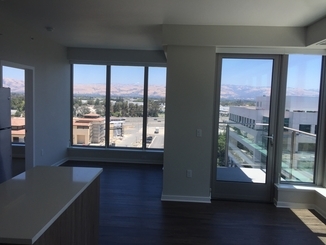 We have leased a small 1,100 square foot apartment in the city of San Jose, CA. We had a Pod delivered last week, and my husband and I boxed up about 40 boxes and placed them in the Pod. We're taking all of our dishes, baking dishes, pots and pans, but getting rid of the Christmas dishes that were handed down from my mother-in-law, may she rest in peace. We're also selling our oak dining room table that with two leafs inserted can sit 12 people. It won't fit in our apartment's eat-in dining area that will seat at most three people. We are also selling our bedroom furniture that is almost 30 years old. Originally from the Philadelphia area, we purchased a beautiful early American looking bedroom set when we got married, with a four poster bed, a chest of drawers, a bureau with a tri-fold mirror and two nightstands. The bedroom furniture is being sold at an estate auction tomorrow, as is the furniture in the rest of the house. It was much more upsetting to me while I was in the house, and packing things up in the Florida summer sun, than it is now that I have moved with a few of my belonging 3,000 miles across the country. Shortly before I moved, I put down our 16 year old dog, as he was just old and miserable. He certainly would not have made the trip. I looked into having our dog fly by air, having a pet transportation company pick him up and transport by car, as well as transporting him myself. Not having a dog around was miserable the first week, but moving to a new location has certainly helped with grieving an old and loved dog. So, onto the new apartment in San Jose, California! It is in a cool, urban environment - which means very noisy at times. We had the window in our bedroom open last weekend, and we heard a hammer hitting something hard last weekend at 6:30 on a Saturday morning. They are building a casino and hotel/office space across the street, so it can definitely be noisy. Not only that, but the light rail stop is right below our window, with "ding, ding, ding" every 30 minutes. Let me know if you have downsized or made a major move in your life. So far, I am enjoying getting to know my new city, but I wish the Pod that we stuffed with our boxes of our things would be delivered sooner. I did receive my car yesterday, which is great. Getting around town, though, is a whole different experience than living on an island in Florida. Good thing I have a car that can accelerate quickly when I need to, especially when I either miss an exit or if I have to turn around. Eight months later and I still have to use my phone to get me places. There are highways everywhere here, and the traffic is insane. We moved to a downtown apartment to be closer to the restaurants and clubs that we like to frequent on the weekends. I still have not adjusted to the cooler temperatures of Northern California - nor the insane prices for absolutely everything. My business is looking up though, so that keeps me busy. Thanks for reading!